It's refreshing to be dropped into Mount and Blade 2's medieval sandbox with no objectives whatsoever. There are no arch demons to thwart, or evil kings to overthrow, I'm free to quest for riches and better pants instead. Like the first game you can hire warriors and fight alongside them in third-person battles, and as a mercenary you're free to take jobs with any town vendors you fancy. You can enter towns and wander up to a quest-giver, or pick them from a menu screen to save time. As you complete jobs they will like you more, and you can hire more advanced soldiers. Soldiers level up after battles and evolve into better troops over time. The sequel looks a lot better than the first game, but it's still endearingly low-fi compared to RPGs with a similar tone like Kingdom Come Deliverance. Instead of graphical fidelity, Mount and Blade 2 promises freedom. You move between towns on a map of Calradia that feels like a JRPG world map. Roaming warbands are represented as lone soldiers or horseriders. Traders zip between towns like little board game pieces. If you stand still the sandbox busily swarms around you. Roaming warbands are represented as lone soldiers or horseriders. Traders zip between towns like little board game pieces. There isn't time to dig into Mount and Blade 2's most ambitious features. Eventually you can go to war with entire armies, and lay siege to castles in massive battles. In the beginning you're just another citizen. I could have entered some tournaments to win money and favour in duels, or I could have allied with the criminal elements in town. Instead, I played as a roaming enforcer helping the local militia to fight off bandits. Combat will be very familiar to Mount and Blade: Warband players. From horseback I hold the mouse button to wind up a strike and then release at just the right point to cleave the enemy. The horse's momentum factors into the power of the blow, which guarantees a kill if I chop roughly in the head area. Fighting requires careful cursor control because blows don't track or lock on to targets. You can move your body angle and feet as you swing to make sure you connect. As the enemy swings at you, you adjust your body angle to make sure the blow misses or lands on your shield. The flailing and disconnected leg movements make the fights look and feel desperate, but there's skill to it, and the wide array of weapons, shields, and armour create meaningful variation between troops. Your units fight in gaggles that you can direct, to an extent, with commands. Fights are nonetheless quite haphazard, as you might expect from a rabble of bandits and hastily assembled militia fighters. There are a lot of amusing little moments. When you win a battle by routing or killing the enemy, everyone in your rag-tag army stops and cheers as though they've just won a football match. I went into town to meet up with some criminal types in a back alley. I found both staring at a brick wall. When I questioned them they gave me the exact same paragraph of dialogue about being loyal to their gang leader. 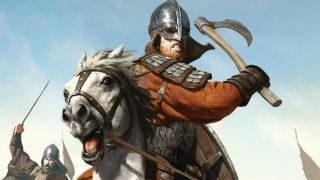 Mount and Blade has always been a bit wonky, but that's part of its appeal, and the sequel shows a strong commitment to player-driven stories in a bustling sandbox world. Mount and Blade 2: Bannerlord's release date is yet to be announced.